Findlay Moir, Underwater Engineering Services, UK, explains how efficiency is being maximised across the decommissioning arena. While the pause button has been hit on investment for exploring new North Sea field developments, the collapse of the global oil price and diminishing natural reserves has created the opportunity for many North Sea companies to position themselves to become major players in the region’s promising decommissioning market. In its recently published Economic Report, Oil & Gas UK pointed to decommissioning as the only area where expenditure is forecast to increase. The findings stated that: “Over £1 billion was spent on decommissioning in 2015 and this is expected to reach £1.5 billion this year before increasing further to around £2 billion in 2017. Since 1966, approximately 45 000 km of pipeline has been installed in the North Sea. Between 2015 and 2024, it is estimated that nearly 2400 km is to be ‘made safe’ in the Central North Sea, Northern North Sea and West of Shetland areas. This is expected to peak in 2021 when 11 assets are scheduled to be decommissioned. The ‘making safe’ of pipelines involves depressurising the pipeline and removing any hydrocarbons. They then must be cleaned and purged with the help of pigs to inspect them, leaving the lines hydrocarbon-free until the next phase of decommissioning. This involves the safe retirement of these networks as the pipeline may be reused by the operator for further projects, or recovered and removed permanently. Primary considerations include long term liability, cleanliness standards and national requirements for making the pipelines safe for potential re-use. Underwater Engineering Services (UES), part of the ATR Group, is one company that is well established on the growing decommissioning scene. The division specialises in the supply of marine and subsea support equipment to the diving, ROV and decommissioning sectors within the offshore oil and gas, and renewables industries. As the industry continues its quest to find and embrace ways to improve efficiencies across the board, galvanised interest has been generated in the company’s decommissioning equipment and packages as well as their personnel to man the various tasks both onshore and offshore. Options for decommissioning include full removal, cutting in situ, trenching and burial. Every case is unique and the approach adopted will be based on comparative assessments of the different options and a number of factors including safety, environmental, technical feasibility, other sea users and cost. 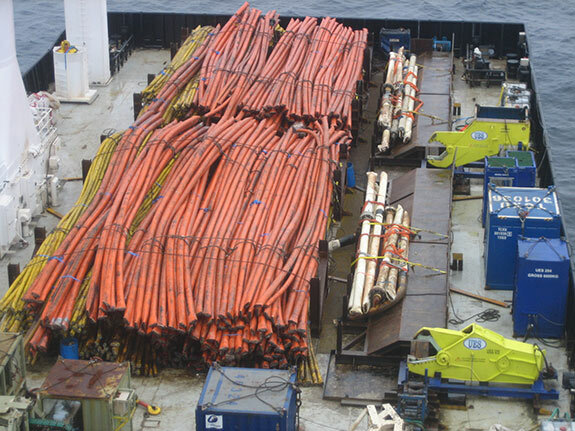 The company has been able to deliver the types of pipeline cutting activities required to remove pipes on site from either a topside position or subsea. The business provides a wide range of equipment with material cutting capability encompassing slings, steel sections, flexibles, mooring wires, studs and bolts. This includes small hand held cutters through to large subsea shears with a 17 in. outside diameter cutting capacity. A length of pipeline is cut by shears in an offsite trial. Pipelines in the UKCS include both rigid pipe and flexible flowlines, diameters can vary between two and 44 in. Rigid pipeline is generally high strength encased in a concrete pipe wall or synthetically coated produced from different source materials to take advantage of the subsea conditions and ensure the desirable strength and chemical resistance are met. In the 1980s, the oil and gas industry began the move towards deeper water and using floating production storage and offloading (FPSO) platforms to process and store hydrocarbons in areas where no pipeline infrastructure existed. A typical flexible pipe may have many concentric layers of steel, plastics and spirally wound steel fibres, each performing a different function. These structures combine great axial and pressure containment strength with a high degree of bending and flexibility, making it ideal for the risers connecting FPSOs to subsea production wells. UES has completed a significant number of decommissioning projects to date within the UK Continental Shelf and Norwegian waters and is continuing to build on its impressive portfolio. It has a 10 year track record which has seen the company carrying out almost 7000 cuts topside and subsea. The division has decommissioned materials including power cables, umbilicals, flowlines, flexible risers and rigid pipe. 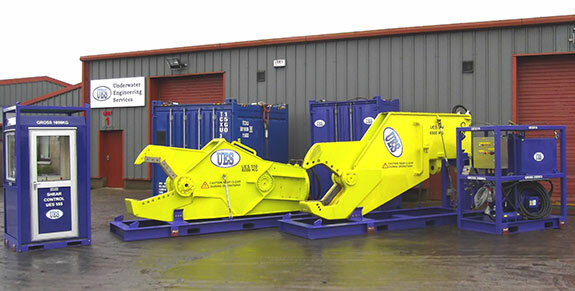 UES twin package can include a Veractert hydraulic shear abd Cat S80. One decommissioning method best suited to the safe, quick and efficient cutting of pipelines and flowlines, whether made from rigid or flexible material, is the utilisation of large hydraulic shears. The company utilises two types of cutting shear. 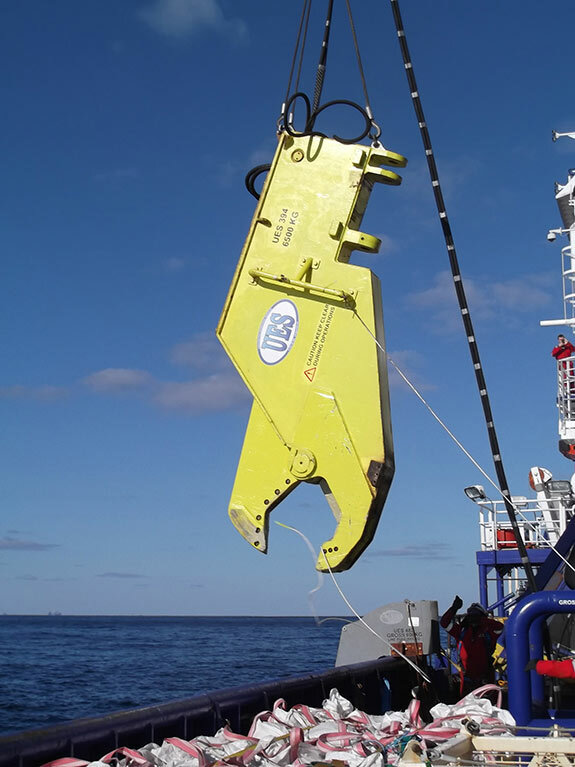 The first is the Verachtert hydraulic shear, (VHS 60) and is generally used for topside cutting but can also be configured for subsea deployment.This cutter has the largest mouth opening of the two offered with an 800 mm opening jaw height and 830 mm jaw depth. It delivers a crushing force of 9850 kN, making it the most powerful cutting performer in the UES fleet. The alternative is the CAT S80 shear. This apparatus can be used for both topside and subsea decommissioning projects. With a jaw opening of 620 mm and jaw depth 820 mm, this has a crushing force of 8809 kN. For subsea operations, the CAT S80 has two sets of lifting assemblies to enable it to carry out cuts either horizontally or vertically. Both cutters have dedicated transit frames which can also be used for deck cutting operations. The shears operate at a maximum of 350 bar and therefore a suitable hydraulic power unit (HPU) is essential to provide the necessary operating parameters. UES designed and manufactured the supporting HPUs in-house, the firm still builds its own and client specific HPUs and hydraulic equipment today. Shears being lowered ready for subsea cutting. As pipelines are varied, their removal will largely depend on the information provided by the operator on the type of material to be cut through and the outcome for the pipeline being removed.Consultation with the client determines the preferred method of removal and in turn the relevant equipment package best suited to the operation. Subsea operations generally consist of either a single cut at the start and end of the pipeline which is then recovered onto the back of the vessel for disposal in its entirety or further cutting into sections. Multiple cuts may also be carried out subsea to cut the pipeline into smaller manageable sections which will later be recovered. Topside operations are usually saved for umbilicals and flexible flowlines. Once they have been winched on-board, they are run through a tensioner system onto a cut table where the shear slices the pipeline into smaller sections to be removed and taken back to the port. The company has experience in delivering tailored equipment packages for either topside, subsea or both applications and depending on the configuration, the equipment supplied may consist of cutting shears, hydraulic power units, control cabin, hose deployment reel and over boarding equipment. Pipeline is removed and cut ready to be mobilised back to shore. Two shears better than one? Engineers at UES delivered a decommissioning campaign for a North Sea operator in 2012 which involved using a twin shear package. The project saw the two shears being utilised simultaneously on the back deck of a vessel, allowing them to pull in twice the volume of umbilical and double up the speed of removal. Each shear utilised a dedicated HPU allowing the shears to operate simultaneously. Also included was a heated control cabin to allow the technicians to operate the equipment at a safe distance and monitor the control systems for both the shears and the HPUs. The largest rigid pipe that is recommended for cutting with the shears is an outside diameter of 450 mm, with a wall thickness of approximately 20 mm. However, it will also depend on the grade of the pipeline and therefore conducting an onsite trial is highly recommended. Following a consultation between UES and the client, depending on the type of material to be cut, a trial may be carried out. These trials are provided on-site to confirm suitability, cut times and overall performance. It is actively encouraged for the client and operators to be present to witness and record results as well as developing an understanding of the equipment which ultimately proves to be very beneficial during the campaign. Technicians and engineers offer support by attending meetings, hazard identification and risk assessments, trials and familiarisations as well as the final offshore project. The overall support is further strengthened by 24 hour on call assistance. Decommissioning is the biggest challenge ahead for an industry which is currently seeking to maximise economic recovery. It is a careful balancing act but one the sector must be fully prepared for. The need to control costs and maximise efficiency is recognised across the industry today, and those principles equally apply across the decommissioning arena. 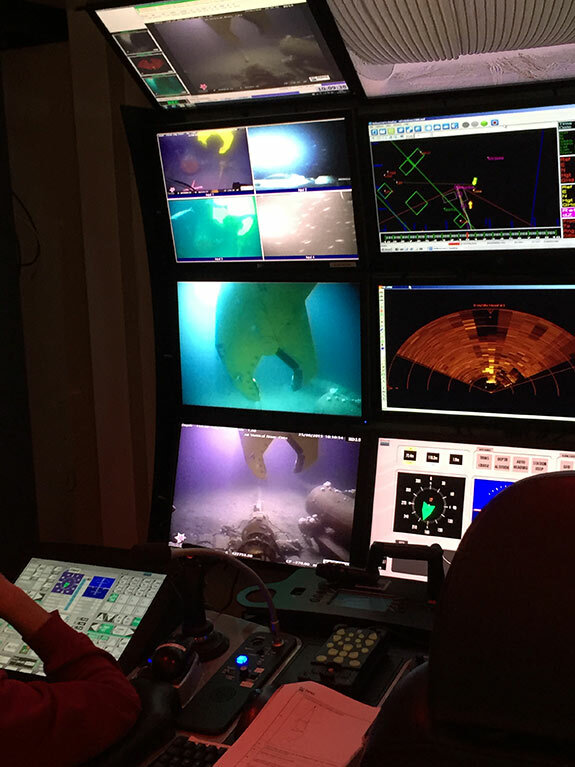 A technician monitors the shears subsea. Edited from an article written by Findlay Moir.